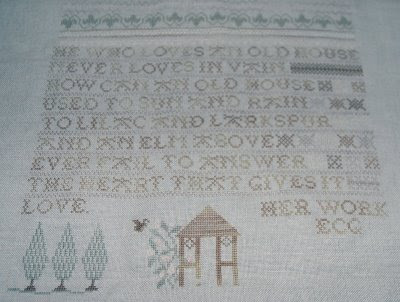 Bits of My Own: Getting closer to the end . . .
Getting closer to the end . . . I have already signed my name, even though it seems funny to do that before I have finished the whole piece, but that is the spot it is supposed to go. Then I moved on to the aviary part. I finished 3 trees and the gazebo. I only did one of the birds. There are many more birds and other animals in this part. The rose bush was the most challenging. The roses are done with the ribbed spider web wheel stitch. Hopefully you can see the roses in this close-up shot. (click to enlarge all pictures). Bee update: The damaged hive is behaving as if they have a new queen! For a while there was just erratic flying about the hive, but now Keith reports that he sees the bees returning to the hive with pollen. Supposedly they won't forage if there is no queen. Keith smoked them and peeked inside. The hive is very weak, few in numbers, but it does seem to be operating normally. Now, the big question is whether they can make enough honey to sustain them through the winter. The other hive that was damaged is also weak, but doing a little better. One of the problems is all the rain we have had this spring (over 10 inches in June alone)! The bees need lots of sunny days to make the honey. They have been few and far between this year! Well, that's all 'til next time! With any luck, July and August willbe better months ... 10 inches and 24 days of rain in June, incredible!!! By the way, I only just mailed your Rabbit Rondel this morning ... I was on vacation and travelling the last two weeks of June. 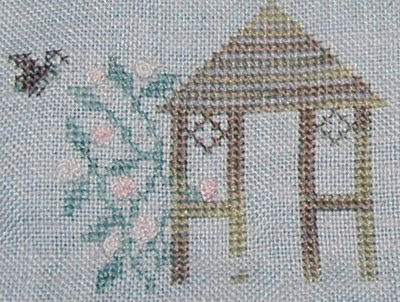 What a pretty progress on your sampler. The rose bush looks so great. Good that the bees have returned to the hives and continue producing honey. Hopefully they will survive the next winter, too. the sampler look beautiful. i hope the Hives be strong soon. The Old Aviary is Finished!